I have enjoyed sloppy joes since the early days of marriage when I didn’t know how to cook anything unless it came out of a box or can. When I made a commitment to limit high fructose corn syrup in our families diet, I had to say goodbye to my friend Manwich. I have tried several homemade recipes that were OK, but they just didn’t do it for me. 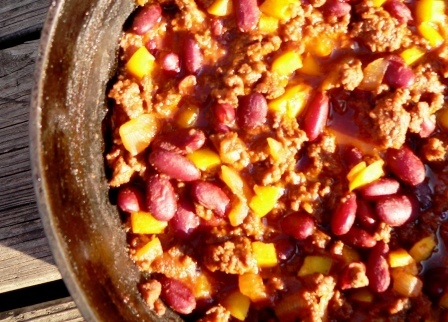 Then I found this recipe: Sloppy Joes…The Real Food Way. I love the title. I love the recipe. My search for a good homemade sloppy joe recipe has ended. While there are bold and spicy sloppy joes, I prefer sweet ones. This recipe satisfies my sweet tooth. It’s super easy to throw together and I always have the ingredients on hand. Add peppers, onions and garlic and cook until soft. Add the remaining ingredients and bring to a boil. Reduce the heat and simmer for 10-15 minutes or until the sauce thickens. Serve on allergy-friendly bread or in a baked potato. You may also enjoy Easy Pulled Barbecue Chicken and Nancy’s Green Beans and Sausage. Sloppy Joes with beans is a new twist for me. But, I am guessing my family would love having beans in their sandwiches. Going to have to try it. Thanks for linking up to Hunk of Meat Monday. For us it’s either add beans or a second pound of beef. I’m too cheap for more beef! This is great! Please share it at FAT TUESDAY! my boys will LERVE this! thanks!! woudl be a great addition/mix up to a sweet potato..
Lib, Do you mean you would add sweet potato to the sloppy joe mix or put the sloppy joe mix on a sweet potato. Both ideas sound interesting! I loved sloppy joes as a kid though I haven’t had them in years. I’m all for adding beans to the mix. More is better… Looks great! I think all kids like Sloppy Joes. Thanks for leaving a comment Jason! I meant to use as stuffing/topping on a sweet potato:: or what about a “twice baked” sweet potato with this as the filling! Sounds great Liberty. I just might have to try it. wow, this recipe looks amazing. i am gluten-free and processed sugar-free, so this would be great for me! thanks so much! Welcome Bailey! I am so glad you can use the recipe. Hope to see you around soon. Homemade sloppy joes looks delicious. we will appreciate if you link back to any one of present host of Hearth and soul blog hop. Thanks for sharing with hearth and soul blog hop. Haven’t made this in so long. I love the look of your recipe. I just love that you put the red beans in your Sloppy Joes. Your flavor combination looks great! Hope you have a wonderful holiday week end and thanks so much for sharing with Full Plate Thursday. this looks delicious! Thanks so much for linking up to Tuesday Talent Show! I would love to have you stop by and link up again today with more great projects! Did you get my email? You were chosen to be the next featured Food-“e”-Friend at MaFF Monday, but since I had not heard back from you I wanted to touch base to see if you’d gotten my email.